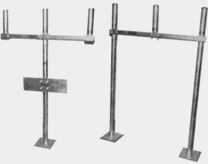 Supports for meters, indicators, transmitters, regulators, gages and other instruments for plant or field. Constructed of 2 and 2 1/2-inch schedule 40 pipe. 2 and 2 1/2 -inch x 3/16 wall square tubing, 1 5/8 - inch x 1 5/8 - inch strut.